In ONE WEEK my daughter will be one. ONE! 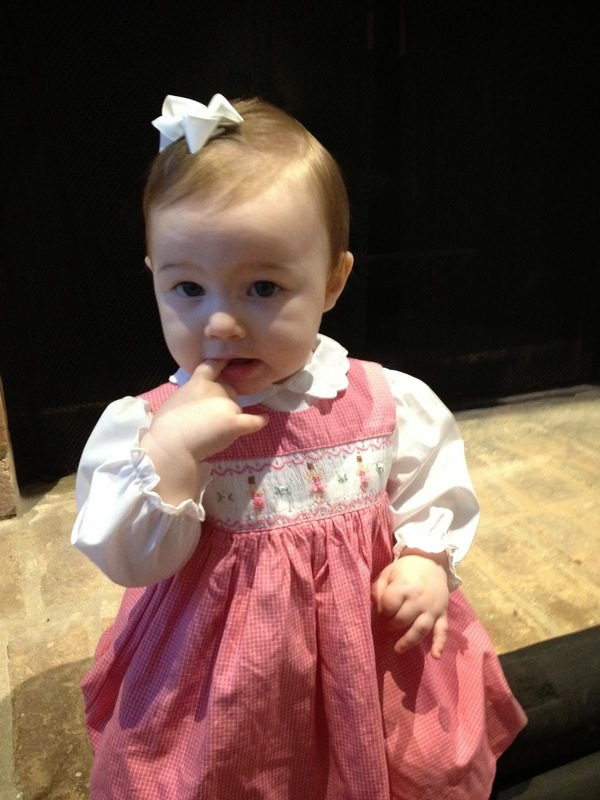 However, Charlotte is not wasting time diving headfirst and fearlessly into toddlerhood. Sadly, unless she’s fallen asleep in my arms right before I put her down for the night, she has no resemblance to the tiny baby who slept soundly on my chest for hours at a time less than 365 days ago. Let’s be honest, this will be my first experience raising a toddler. Sure, I’ve been around toddlers a lot the past 3 years. I’ve read about them on blogs, seen frustrating tweets about their antics, and witnessed my friends corralling their own little people. But my own 3 year old was never a toddler. Obviously, he never “toddled”, but there’s also the fact that I never had to try and reason with him about things that were totally unreasonable, wipe his dirty bottom while he contorted himself into unnatural positions and tried to escape, have food thrown in my face or on the floor, or dealt with ohmygodistheworldendingbecauseyouarescreamingsoloud tantrums. I guess in these aspects, you could consider Grayson “easy” (ha). So here we go. Lately, Charlotte has been giving me a preview of what’s in store for us over the next few years. And yes, I know we haven’t even scratched the surface of toddlerhood yet. Just wait until she starts walking, right? Eeeeek! This morning, we didn’t have Grayson’s nurse, so I had to get both kids ready solo. This is doable, but difficult. Grayson’s morning routine involves a lot of medication in syringes (which you know Charlotte is very interested in), changing his diaper, his undershirt onesie, getting him dressed, refilling his feeding bag, combing his hair and putting on his AFOs and shoes. And he’s extremely stiff in the morning and can’t “help” at all, so it takes time. With no distractions or Charnado in the mix, it takes 30-40 minutes. Enter Charnado to the scene. I get Grayson out of bed, but him in his baby gym and turn on his Veggie Tales. He’s happy as a clam. I turn off his feeding pump and unhook the tube from the extension. Charlotte makes a beeline for the pole, pulls herself up on it, and it crashes to the ground and she hits her face on the floor. Screaming commences. I’m giving Grayson his medicine and Charlotte is all up in our business, trying to help. She takes each empty syringe one by one, and either puts them in her mouth or tries to give them to Grayson in his button (smart girl). When she’s tired of that she crawls over to the pole again, grabs the hanging tube, flings it, and formula starts flying all over the room- aaaa! I take it away from her. More screams. I then go to change Grayson’s diaper and Charlotte, once again being a big helper, starts pulling the wipes out of the box one by one. Then she decides that Grayson’s face needs a cleaning. He LOVES that (sarcasm font). I remove her from his presence. Screaming. Charlotte finds my purse on the couch and empties the contents all over the floor. She takes all the cards from my wallet one by one and tosses them around the room and under the couch. Then she finds some homeopathic flu beadlet things in a container and starts shaking it like it’s a maraca at music class. I let her do it. While I’m putting Grayson’s clothes on, Charlotte decides the socks that have been on her feet for the last hour are no longer acceptable and frantically tries to pull them off. They are the good kind that don’t come off (ha) but again, this causes more screaming. I put Grayson in his orange chair to comb his hair. Charlotte wants her hair combed too and she thinks it’s hilarious that I alternate between combing her hair and Grayson’s. 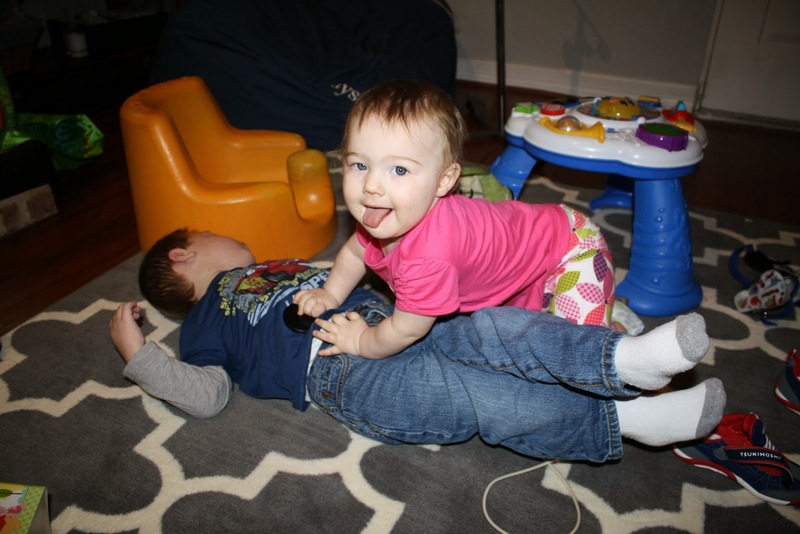 It’s pretty cute, until she decides she wants to do it herself and starts combing Grayson’s face. Grayson starts throwing up. 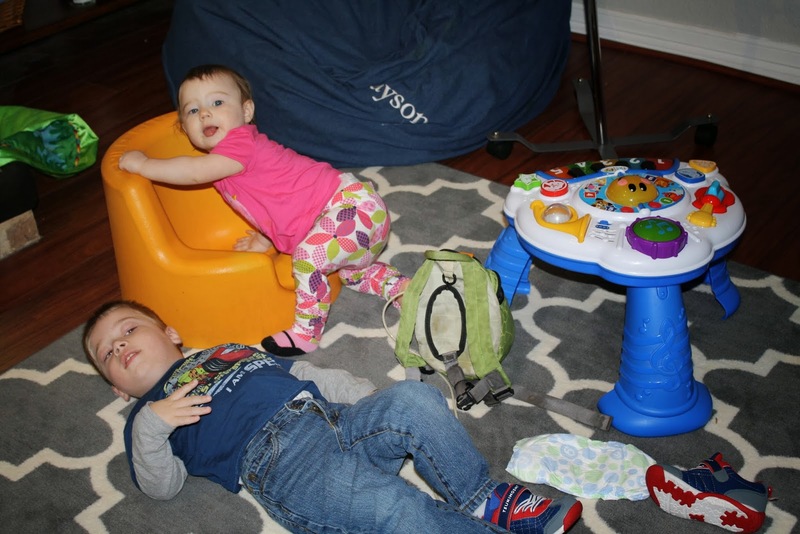 While I’m holding his head and a towel underneath it to catch the vomit, Charlotte takes this opportunity to pull up on her brother, laugh manically, and pull his hair. I then put Grayson in his beanbag chair. 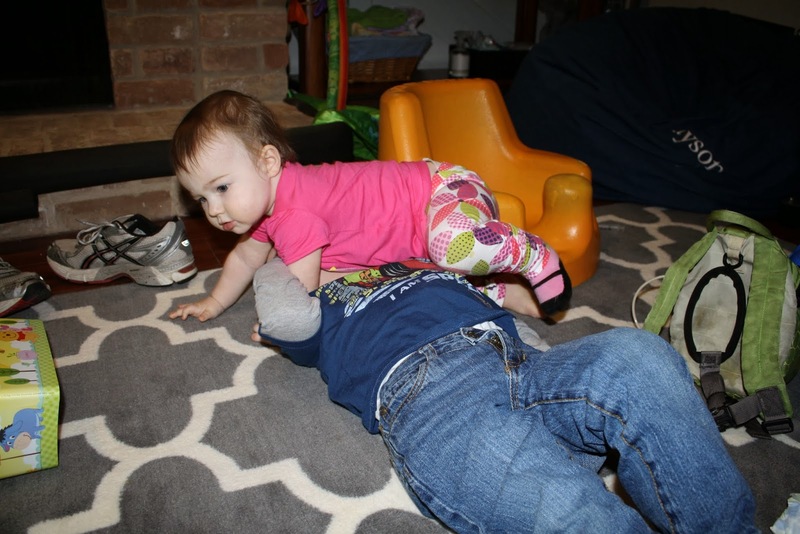 Charlotte races over and climbs on top of him and starts bouncing and saying “Hi Gray Hi Gray”. Adorable accept for the fact that my poor defenseless boy is totally getting pounded on his stomach, just moments after vomiting. At this point, I’m feeling a tad exasperated with her but I consciously make a huge effort to control my emotions- this is, after all, normal. And after Grayson, I will forever be thankful for normal. So instead of saying “No” for the hundredth time in 30 minutes, I put Grayson’s headphones on him, scooped Charlotte up, and I turned on a praise song I downloaded yesterday after hearing it at church. We listened to that song 3 times and danced around the living room. 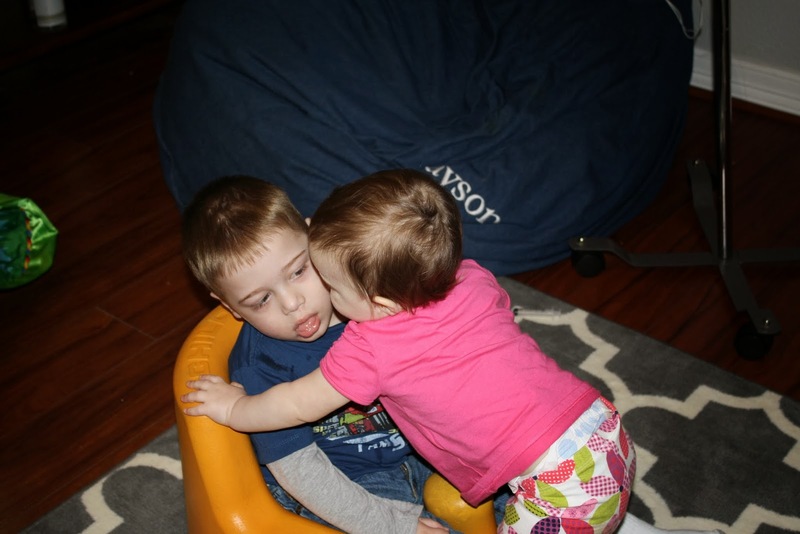 It was fun, calmed us both down, and gave poor Grayson a break from his sister’s relentless “affections”. Because really, what can I do? Not much about Charnado, evidently. But I can be thankful and praise God that she is who she is, a sweet, precious, healthy whirlwind of an almost-toddler, who surely is going to make life very interesting in the years to come. Your words painted the chaos so perfectly! I laughed and cried at the same time reading this!! 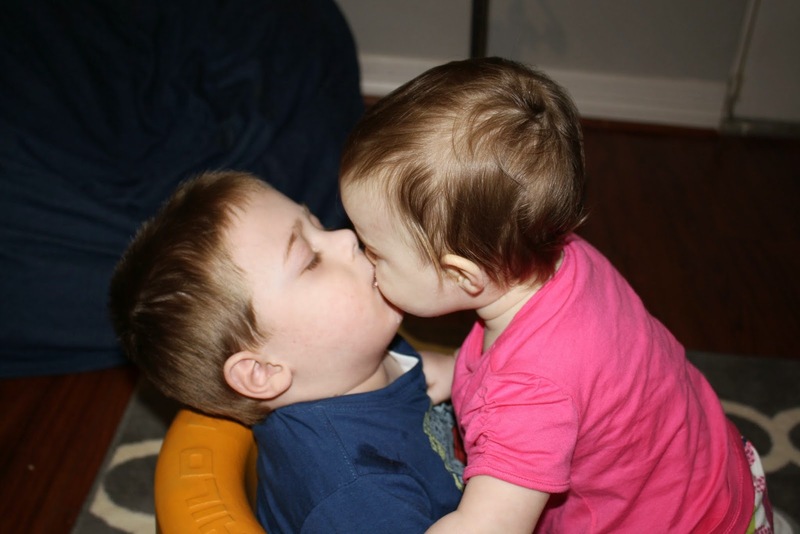 Parker is 12 mo and has done some of the exact things as Charlotte to his defenseless 10 year brother who has special needs! We are living the same lives and it's so amazing, wonderful, crazy, and tiring at the same time! She's going to be a handful! 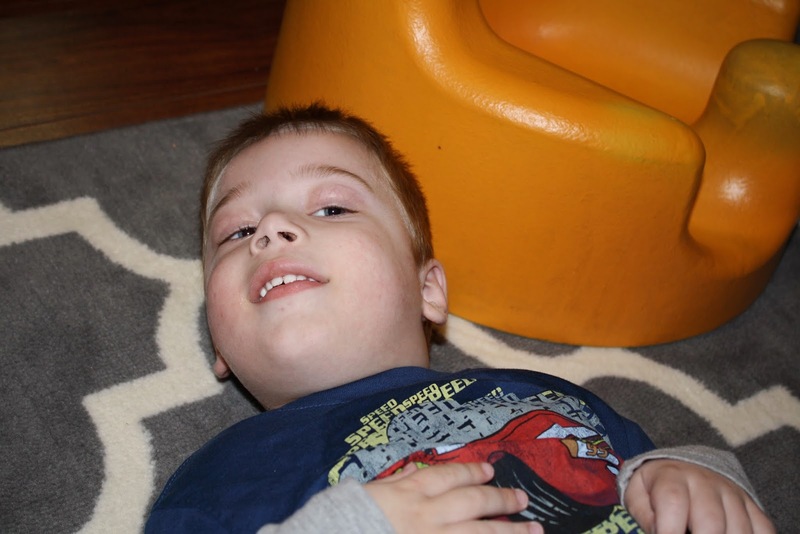 My very laid back baby (Matthew) turned into an energetic toddler around 18 months. They ate so much fun though! Ahhh!!! Happy almost birthday, Charlotte! I know I say this every time, but I just LOVE reading your posts! They are so real. I love that my life will be so similar very soon. I love that I will get to experience “typical” and “normal” for really the first time, and that Grace will be in the same position as Grayson…defending herself and trying to escape Micnado (Micah) 🙂 Sending love, my friend!